Bring on the clan! This table is set for a crowd! 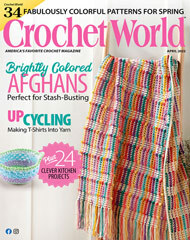 This e-pattern was originally published in the October 2009 issue of Crochet World magazine. Size: Place Mat: 18" x 12". Coaster: 4 3/4" x 4 3/4". Napkin Ring: 7" x 2". Table Runner: 33" x 15". Pot Holder: 7" x 7". Bread Cozy: Fits regular-size glass loaf pans. Casserole Cover: Fits 8"-square glass baking dish. Made with medium (worsted) weight yarn and sizes I (5.5mm) and K (6.5mm) hooks.